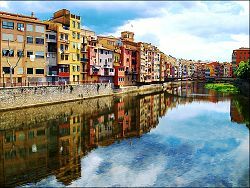 The city of Gerona (spelt Girona in Catalan) lies on the confluence of the rivers Onyar and Ter, approximately 30km inland from the Costa Brava coastline of northern Catalunya and 100Km north of Barcelona. 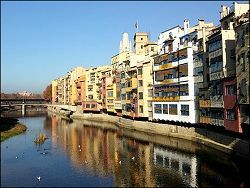 It is well known for it's multicoloured houses beside the river but also has many other notable buildings. 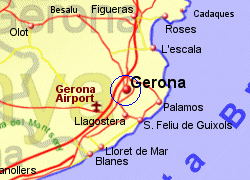 Gerona was important in Roman times and has Gothic Cathedral built from the 14th to 16th centuries. 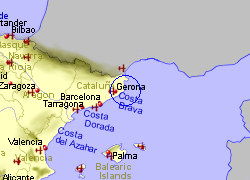 Parts of the old city walls and its towers (dating from Roman times though rebuilt in the 16th century) still exist. 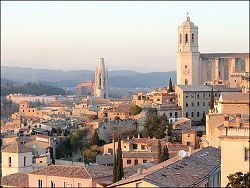 It is possible to ascend some of the towers and view the old parts of the city. The city has 11 bridges, including one of steel built by Gustave Eiffel. 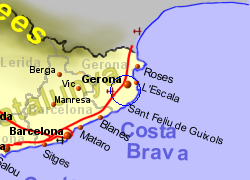 Map of the Gerona area.